AMO was part of the EU Graphene Flagship delegation at the Tallinn Digital Summit on September 29, 2017, where research results and key technological advances enabled by graphene and related materials were explained to European Heads of State and Government. The Tallinn Digital Summit, held under the Estonian presidency of the Council of the European Union, is a platform for Heads of State and Government from across Europe to launch high-level discussions on digital innovation with the aim of keeping Europe ahead of the technological curve while becoming a global digital leader in the next years. The participants focussed on trends and technologies likely to emerge in the next ten years and their impact on crucial areas of security, e-government, industry, economy and society. Academic and industrial co-exhibitors from across the Graphene Flagship consortium presented many different demonstrators to illustrate the potential of graphene and related materials in Europe’s path to global digital leadership. The presences of the EU Graphene Flagship project was a unique opportunity and a great honour at the same time to show the highest decision makers what Europe can achieve by working together towards a common goal, and demonstrates that the Flagship is well on its way to realize its ambitious goals. 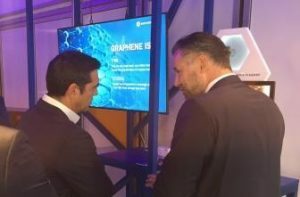 Professor Max Lemme (AMO GmbH and RWTH Aachen University) explained Graphene and many of the latest Graphene Flagship achievements to the Greek prime minister Alexis Tsipras. Professor Max Lemme, Director of AMO GmbH and Chair of Electronic Devices at RWTH Aachen University, had the opportunity to explain many of the latest Graphene Flagship achievements to the visitors, including several Europen Heads of State and Government. “Graphene is a very exciting material and we are moving our research towards higher technology levels. This is where innovation happens, and we are confident to enable new applications in (opto-)electronics and sensorics with graphene and 2D materials.” stated Professor Lemme. The Graphene Flagship exhibition area showcased the work of academic and industrial co-exhibitors from across the consortium on five application areas: sensors and the Internet of Things, devices for the digital world, society and healthcare, energy and solar cells, and composites. The exhibit at the Tallinn Digital Summit allowed the Graphene Flagship to show the important part Graphene will play in technological innovation for our digital future.